We let out a big sigh when it came time to leave the tranquil Nimmanoradee Resort, situated near the far southern tip of Samet. Average rating 7.8 from 1,001 reviews. Along with numerous kayaks, a small swimming pool, Thai massage salas and a gazebo-style restaurant and bar, the grounds brim with orchids, frangipani, hammocks, swings, birdsong and secluded benches and loungers. The pastel-pink windmill might be overly cutesy, but hey, visitors need something to selfie themselves with. Before settling into a day of lounging on the beach under low-hanging branches, take a walk out to the tip of the cape to catch the sunrise. Nestled on a hillside with direct sea views, bright octagon-shaped wood-and-concrete cottages are painted pastel yellow, pink and blue. Arguably the most charming rooms on Samet, they come in a few different sizes and boast white walls and floors, high ceilings, several windows, paintings of lotuses, soft lanterns, air-con, TVs, fridges, polished hot-water bathrooms with basin sinks and showers partitioned behind glass. Little stoops have a seat or two out the front, though most guests walk down to one of the better chill spaces beside the coast. With double beds on either side of the largest rooms, families will be well-taken care. Nimmanoradee is also popular with honeymooners, and if here on a weekend you might find yourself swept up in a Thai wedding reception. Though English is not the staff’s strong suit, they’re very polite and can arrange snorkelling, fishing trips, kayak rental and speedboat transfer direct to/from the resort. The free (but slow) WiFi works only in the restaurant area. An online browse revealed that rates on the big booking sites were 25% cheaper than the walk-in rates that we were quoted. We also found sizeable discounts offered on the resort’s own website if staying two nights or more. Check rates at Nimmanoradee Resort on Booking.com. Plus 300 baht for beachfront. 5,800/6,300 for deluxe family bungalow. 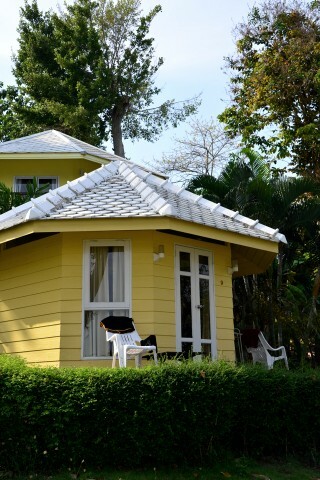 Room: Bungalow fan private bathroom, low season: 3,000 baht, high season 3,200 baht. Notes: Plus 300 baht for beachfront. Room: Family room, low season: 4,300 baht, high season 4,800 baht. Notes: 5,800/6,300 for deluxe family bungalow.